Rocket League Mac Review: Can you run it? Combining soccer with racing, Rocket League is an outstanding physics-based game with high-flying cars that can score amazing goals and pull off game-changing saves. The gameplay is extremely addictive as it is, but take it online only and you get one of the most engrossing (and competitive) multiplayer experiences in modern gaming. Needless to say, Rocket League’s gameplay is so satisfying and balanced, it has hooked millions of players, including myself. Released for Mac in September 2016, Rocket League is one of those games that the older it gets, the more popular it becomes. Yet, Rocket League’s secret is simple: a thriving Multiplayer community. Rocket League emulates the emotional surges typical of The Beautiful Game, such as the rush of an unexpected fast break or a well-timed header into a goal. With Rocket League, the promising concept of combining two wonderful things–cars and soccer–is equally magnificent in execution. Not today. Gamers loved it too. Rocket League currently has 93% positive reviews from over 143,000 gamers. For reference, that’s insane. My take? You can’t go wrong with this game. I was so hooked when it was first released, I almost forgot FIFA will never come back to macOS… And it only took a few matches (for the purpose of this review) to get me hooked again. This game is just that good. It’s extremely hard to master, yet so much fun after a few matches. High-end Macs (the 2014 iMac). New, but basic Macs (the 2016 MacBook Pro). Older and basic Macs (the 2012 MacBook Pro and the 2014 Mac Mini). This way, the chances your setup will be similar to one of these will be high (thus making comparisons for you easier). Why these settings? 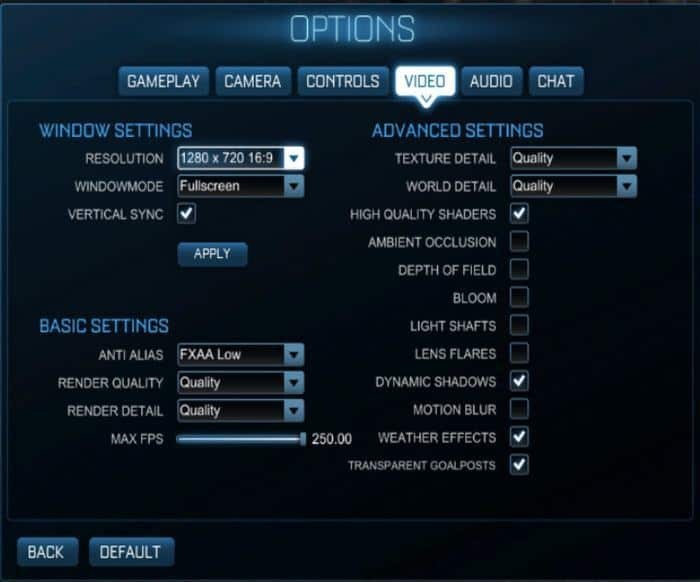 1280x720 is considered HD and the rest of settings are roughly equivalent to a Medium preset. This should create a relevant playground to test both powerful Macs and more basic (older) models. We were pleasantly surprised with the performance levels Rocket League delivered. And remember, a competitive multiplayer game needs more than a decent frame rate… We usually aim for a minimum of 30 frames per second (FPS). A game like this requires consistent frames per second, otherwise, lag due to performance coupled with lag due to network issues would create an intolerable experience. Gladly, the results were surprisingly good! This is what you should expect depending on your setup. As can be expected, having a high-end Mac guarantees great performance. But what is a high-end Mac you wonder? Put simply, a Mac with a dedicated graphics card that has 2GB of Video RAM or more. And this applies to slightly older machines too. For example, my iMac from 2014 model can’t be considered new. Still, it has the best graphics card money could buy at the time. This is why it ran at 60 FPS the entire time. And it didn’t do better because frames per second were locked to 60 FPS maximum. Playing the game at the highest settings and at 1600x900 resolution, the game looked amazing while still running at a satisfying speed of 60 FPS. Do you have a new, but basic Mac? This category is always tough because Mac users have high expectations. After all, you paid over $1,500 for a MacBook Pro, so it should be able to run video games right? Unfortunately, most Macs use integrated graphics and we all know that makes all the difference. Integrated graphics are great for mobility and battery life, but the worst for gaming. So where does that leave us? Unfortunately, there are no rules (except maybe: never expect great results). Still, it all comes down to the game. In this case, I’m happy to report Rocket League runs great on all modern Macs, including those with paltry integrated graphics. For example, my 2016 MacBook Pro squeezed 48.50 FPS out of the game. That’s way over our 30 FPS target and more than enough for smooth gameplay online. Do you have an older and basic Mac? This is where it gets tricky… The 2014 Mac Mini we tested isn’t that old, and the integrated graphics it has isn’t one of the worst out there but the results were nonetheless disappointing… Same conclusion with the MacBook Pro. At 28.48 and 22.22 respectively, those frames per second are below our 30 FPS target. If you are ready to compromise and give up on the eye candy, you can expect acceptable gameplay on older Macs with integrated graphics. By the way, this matches the game’s requirements, which recommend Intel HD Graphics 4000 or better to play this game (more on that below). If you’re still on the fence, I recommend you run the free Unigine Heaven Benchmark using the Basic Preset. Keep in mind that this is an estimate and far from exact. If you are too borderline here, don’t risk it. Bottom line: This is one forgiving game that can be played on most Macs as long as you’re prepared to compromise (heavily) on looks. Remember, if you don’t pay attention to the system requirements, you risk buying a game you won’t be able to play! Pay special attention to that last line. You can play with your keyboard and mouse, but using a controller (I use either an XBOX 360 controller or a PS4 controller) will be much better. I’m the first one to admit it, I didn’t expect Rocket League to run so well! It even supports the old Intel HD Graphics 4000 card! PreviousTotal War: Warhammer Mac Review: Can you run it? It’s good that you mention this… It’s exactly what we have been trying to do (I actually asked all of the guys to run the Heaven test) and reading your comment I noticed I didn’t even include the results… And everything is poorly explained on that front. Hey. I haven’t found official information on this but I’m 99% sure it uses OpenGL (it was released before the big wave of Metal enabled games and hasn’t received any noticeable performance updates since).